I’ve not yet started giving N pocket money. It’s been mentioned, but so far, it’s not really happened. But now he’s getting a bit more wise to the opportunity as there’s things he wants to buy and I’ve said no to. He has pocket money aims. Although it’s not looking good at the moment for him. When I was a child my mum didn’t give us pocket money. We had a school bank, so I think a little used to go in there on occasion, and we did save up money from birthdays and Christmas. Back in the day, interest rates were good and my pittance in my National Savings account grew quickly with little effort. I had to save up to buy a new bike when I was 13, and then to put money towards a saxophone and my A clarinet. But anything else like clothes, stationery or shoes, my mum would buy. We didn’t really want luxuries and there wasn’t the big fashion thing or pressure to have all the latest things like there is nowadays. By secondary school we had a contract in place, where we had to tidy our rooms for inspection each day and would get a small amount of pocket money from that, plus the other chores we were also expected to do. But I never needed an allowance. Pocket money was for the extras or upgrades to the basics my mum would buy us. My brother wanted Nike Air trainers, so he had to pay the extra by doing a paper round and having an evening job in the local pub kitchen. N has always been given a little bit of money occasionally when he helps out on the farm, and to spend when we go on holiday from other relatives. But he rarely spends it, so it sits in a pot (and really needs putting in the bank). He also has some sheep and cows, so they get sold, he buys some more and puts the profit in the bank with the aim that by the time he’s an adult he’ll have money to put towards a house, or car or college etc. But he now wants pocket money. I do expect N to do certain things around the house. But it’s painful. He doesn’t like doing the simple day to day stuff like tidying his things up or taking his stuff upstairs. But he does like doing all the ‘fun’ chores, like helping in the garden or vacuuming. So we decided on a contract. 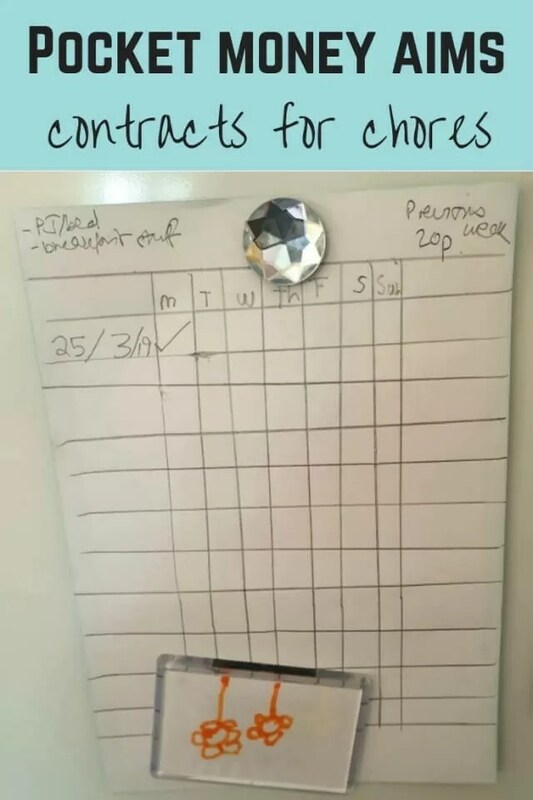 He will have £2 a week pocket money if he does his tasks each day. Basic things that he should be doing automatically anyway. Taking his pjs upstairs and making the bed. For some reason he gets dressed downstairs and leaves the pyjamas downstairs. Put his breakfast plate/bowl etc in the dishwasher. He just leaves it on the side usually, if not the table. Once he’s got the basics, he can also earn on top – 50p a job – for other chores. This was started in August, but didn’t happen for more than 2 days. But we restarted it last week and N was ticking off his chart each day. Last week it went really well. He did his basic jobs each day (well 6 out of 7 which is acceptable), plus helped fold washing and hung his own washing up. He tried to get money for setting the table but that’s not really a chore, plus he just dumped knives and forks on the table, forgot serving spoons and mats. So it was incomplete. Week 2 isn’t going so well. 1 day complete, 2 days with pjs dumped on the stairs and missed when going upstairs for his shower. Why are men incapable of picking up their things on the stairs as they go up? The OH will pick up his own washing, but he won’t take N’s stuff up even if he’s taking him up to sort out his shower. N will take up 1 item I ask him to take, but will ignore everything else of his on the stairs. I think yet again, it’ll be a cheap time for me. N asks for pocket money, agrees the tasks, and seemingly really wants to earn the money, but then won’t keep it up. The main problem is that he has money in his pot from the farm work and birthdays that hasn’t gone in the bank. So he knows he’ll just top up his wallet from that if he fancies buying books or toys for himself in town. Maybe I need to put that money in the bank, and leave a smaller amount there so he’s none to spend. That might force him to take his pocket money efforts more seriously. How does pocket money work in your house? Do your children take it seriously? « School run tips – does the school run have to be painful?